Chris Smith headed east bound for the Goodguys' East Coast Nationals at "The Big E" Eastern States Exposition Center in West Springfield, Massachusetts. With perfect weather all weekend and a smaller autocross turnout than normal, Chris averaged 6-8 runs per hour on Friday between the 48 Hour Camaro and Spectre Performance custom air intake equipped 48 Hour Corvette. Saturday morning brought a larger turnout to the event and autocross, but the runs were still more often than most other Goodguys events. This allowed copious amounts of ride alongs for future racers and fans alike. Chris ended up finishing the weekend with 1st Place in the Speed By Spectre 48 Hour Corvette and 2nd Place with the 48 Hour Camaro. 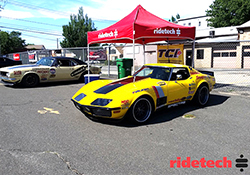 About the event, Chris Smith said, "It was another great weekend for the RideTech Team. When you can get this much one on one time with future and current enthusiasts and put two cars in the winner circle you have to be happy." 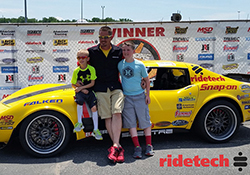 The RideTech team continues the season next in Michigan at the Optima Batteries Search for the Ultimate Street Car where Bret Voelkel will be back in the 48 Hour Camaro's driver seat. 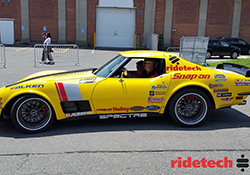 Other RideTech team members planning to attend the Michigan event are Jim McKamey in the RideTech C5 and Chris Smith will be running the Spectre Performance equipped 48 Hour Corvette on its maiden Michigan International Speedway event.